I put in my measurements & it fit like a glove! This dress is amazing. I am a plus size girl and this dress is very flattering. I didnt get it custom made, but I did measure myself beforehand and purchased 2 sizes up. Fit perfectly! I am actually using this dress for my prom and am very pleased with the quality of the purchase and the price. Shipping didnt take that long and overall I am very happy with my purchase. I will definitely be purchasing from this company again. I was worried that I wouldn't like this dress because not everything looks the same online as it does in person, but let me tell you!! 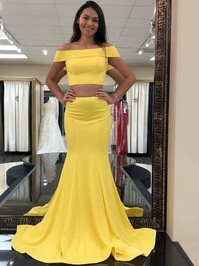 This dress looks nice in the picture, but way better in person!! I'm very happy with the product! It did take a while for it to come in, but it was defiantly worth the wait! I will be buying more from this site! this dress is gorgeous, great fit and very flattering. will be ordering some more, maybe in a different colour. Recommend.